Much has happened during the former Pabst brewery’s decade of redevelopment: a hotel at the former brew house, apartments in both new and renovated historic buildings, a university facility and other projects have revived empty structures and vacant lots. But the picture won’t be complete until early 2019, with more than 430 additional apartments, a 150-room hotel and two new breweries highlighting the final development surge. When that last phase is done, the 21-acre site, now called The Brewery, will include more than 800 apartments, two hotels, three office buildings, restaurants and taverns, as well as new streets and even two small parks — blending what was an isolated former industrial site into Milwaukee’s downtown. The completed $100 million project, helped by $32 million in city financing, expands downtown Milwaukee’s footprint west from the site of the Milwaukee Bucks new arena and marks another huge addition to the ongoing downtown development boom. The Brewery hasn’t drawn as much national attention as it deserves, said Robert Greenstreet, dean of the University of Wisconsin-Milwaukee School of Architecture and Urban Planning. “This is a staggering success story,” said Greenstreet, who also served as Milwaukee’s city planner from 2004 to 2009. “I feel like it’s going to be a whole different place” within two years, said local developer Josh Jeffers, whose BrewLab Lofts will be among those new apartment buildings. Zukerman’s firm, New York-based Whitestone Realty Capital LLC, is converting the former Pabst malt house into 118 high-end apartments, known as The Brewery Lofts, 1009 W. Juneau Ave. The project involves demolishing most of the interior and building seven new floors with new fixtures and restored windows. That work was more complicated than anticipated. The Brewery Lofts, originally due to open this summer, are now expected to open in early 2018, Zukerman said. He declined to disclose the increased project budget, which was initially estimated at $34 million. The project’s financing includes federal and state historic preservation tax credits, which cover part of the restoration costs in return for following strict construction guidelines. The one- and two-bedroom units will have monthly rents from around $1,600 to $2,000. Two other apartment developments are to begin construction soon. Combined with Zukerman’s project, they will more than double the number of units at The Brewery. Jeffers plans to begin work in July on converting two adjoined buildings at 1037 W. McKinley Ave. into 43 apartments. He bought the three-story buildings from Cardinal Stritch University, which is moving its College of Education and Leadership from the larger building to the university’s main Fox Point campus. The smaller building has been vacant since Pabst Brewing Co. closed its operations in 1996 but since has been partially renovated. Pabst used both buildings for its research labs. 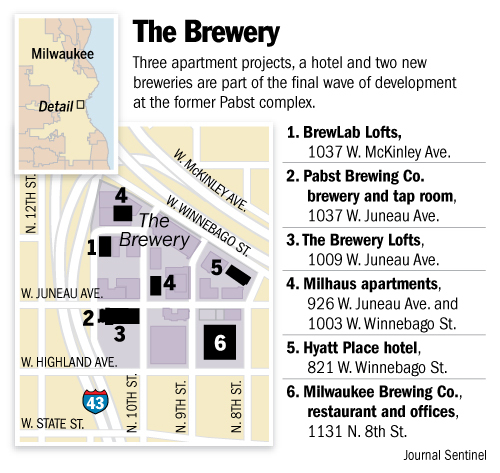 The $8 million project BrewLab Lofts is to be completed by March 31. The financing includes historic preservation tax credits. The one- and two-bedroom apartments, including studio units, will have monthly rents from around $1,200 to $1,900. Also, Indianapolis-based Milhaus Development is proceeding with its plans to build 274 apartments within two five-story buildings, at 926 W. Juneau Ave. and 1003 W. Winnebago St. Those two locations are one block apart. Milhaus plans to complete its purchase of the vacant parcels and begin construction this month, said Greg McHenry, director of development. The $40 million project would likely have its first units available by summer 2018, with both buildings completed by spring 2019, McHenry said. The development would include 27 apartments with around 350 to 400 square feet and monthly rents below $1,000. Those so-called micro units are a growing trend in Milwaukee and other cities. The remaining units, ranging from studios to three-bedroom apartments, would have rents of around $1,300 to $2,400. Both the Milhaus buildings and Brewery Lofts will provide parking for residents at The Brewery’s 900-space central parking structure. BrewLab Lofts has a surface parking lot. Other apartment developments at The Brewery are Eleven25 at Pabst student housing, developed in the former bottling house; Frederick Lofts; Blue Ribbon Lofts, developed in the former keg house; and Brewery Point senior apartments. Those buildings total just under 400 units. Meanwhile, construction recently started on a six-story, 150-room Hyatt Place hotel at 821 W. Winnebago St. Deerfield, Ill.-based Janko Group plans to have the $27 million project completed by summer 2018. It will be the second hotel at The Brewery. The 90-room Brewhouse Inn and Suites opened in 2013 in the former Pabst brewhouse. Finally, The Brewery has an actual brewery, the first there since Pabst closed its operations more than 20 years ago, with another brewery on the way. Los Angeles-based Pabst Brewing in April opened its Milwaukee brewery, restaurant and taproom at 1037 W. Juneau Ave., within the former Pabst training center and Forst Keller tavern. The new $5 million Pabst brewery serves as a place to experiment with new beers and historical Pabst recipes. 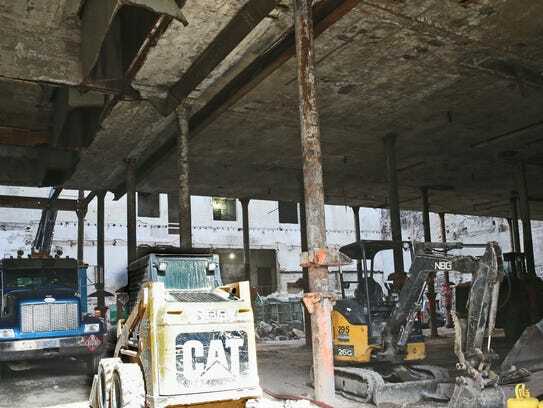 Renovations are to begin this month on converting part of the former Pabst distribution center, 1131 N. 8th St., into a craft brewery operated by Milwaukee Brewing Co., as well as a restaurant, events venue and offices. That 46,000-square-foot brewery, including a tasting room, is scheduled to open in May 2018, said Jim McCabe, Milwaukee Brewing owner. The company will continue to operate its smaller Walker’s Point brewery. An adjacent restaurant, including a rooftop dining area, and events venue will total around 30,000 square feet and likely open next May, said building owner Scott Lurie. He said the restaurant and venue operator’s name will be announced soon. The building also will feature around 50,000 square feet of offices, Lurie said. The former distribution center’s redevelopment includes a self-storage center on the building’s lower level owned by White Plains, N.Y.-based Highland Development Ventures LLC. Known as Extra Space Storage, it will open around June 30, said Adam Hird, Highland managing partner. Other office buildings at The Brewery include a former boiler house and the newly built Pabst Professional Center. Each has around 40,000 square feet. The Brewery also features the University of Wisconsin-Milwaukee Zilber School of Public Health, which combined a former Pabst warehouse with new construction, and Best Place at the Historic Pabst Brewery, which includes a tavern, banquet rooms and a gift shop in the former Pabst offices and visitors center. City spending to help finance The Brewery’s parking structure, street repairs, environment cleanup, demolition and other expenses have so far totaled $26 million and will likely eventually reach $32 million, said Jeff Fleming, Department of City Development spokesman. Those funds are being repaid through property taxes from The Brewery’s buildings. The city debt will be paid off by 2032, according to a department estimate. The new property taxes will then go to the city’s general fund, Milwaukee Public Schools and other local governments. The Pabst site was valued at $9.3 million before Zilber Ltd., led by the late Joseph Zilber, started the redevelopment work in 2007. The new and renovated buildings have so far created $64.2 million in additional property value, with a total new value of $98.9 million expected when the entire site is completely redeveloped, Fleming said. Zilber bought most of the Pabst site in 2006, vowing to create “a great neighborhood, where people will want to live, work and shop.” An earlier attempt led by Wispark LLC to create PabstCity, a mixed-use project that included an entertainment focus, failed to win Common Council support for its $41 million city financing plan. The council did Milwaukee a favor by rejecting that plan, said Greenstreet. He was then city planner in Mayor Tom Barrett’s administration, which pushed hard for PabstCity. City officials supported PabstCity because it was the only viable plan for the crumbling brewery buildings, Greenstreet said. But that proposal would have involved demolishing more historic buildings than those eventually preserved under Zilber’s involvement, he said. Zilber’s decision to take on the project as his legacy to Milwaukee was a blessing, Greenstreet said. “Without Zilber, that would just be a collapsing site now,” he said. Zilber’s conceptual plans for The Brewery called for fewer apartments, and more office and retail space, than has been developed. That shift to more housing is tied to the growing trend of both baby boomers and millennials living in urban areas, which has helped spark an unprecedented downtown Milwaukee development boom. The Brewery’s completion, along with the new Milwaukee Bucks arena and other large downtown projects, will likely help spur investment to other nearby sites, said Larry Witzling, a longtime planner at Graef consulting firm. “The big question is: how fast and where will it spread?” said Witzling, who helped create plans for the neighboring Park East area.